Latvian (Latviešu valoda [ˈlatviɛʃu ˈvaluɔda])[tones?] is a Baltic language spoken in the Baltic region. It is the language of Latvians and the official language of Latvia as well as one of the official languages of the European Union. It is sometimes known in English as Lettish, and cognates of the word remain the most commonly used name for the Latvian language in Germanic languages other than English and Norwegian. There are about 1.3 million native Latvian speakers in Latvia and 100,000 abroad. Altogether, 2 million, or 80% of the population of Latvia, speak Latvian. Of those, 1.16 million or 56% use it as their primary language at home. The use of the Latvian language in various areas of social life in Latvia is increasing. As a Baltic language, Latvian is most closely related to neighboring Lithuanian. In addition, there is some disagreement whether Latgalian and Kursenieki, which are mutually intelligible with Latvian, should be considered varieties or separate languages. Latvian belongs to the Baltic branch of the Indo-European language family. It is one of two living Baltic languages with an official status (the other being Lithuanian). The Latvian and Lithuanian languages have retained many features of the nominal morphology of the proto-language, though in matters of phonology and verbal morphology, they show many innovations[clarification needed], with Latvian being considerably more innovative than Lithuanian. In 1649 settlement of the Latvian speaking Kursenieki spanned from Memel (Klaipėda) to Danzig (Gdańsk). The Baltic languages are of particular interest to linguists because they retain many archaic features believed to have been present in the Proto-Indo-European language. There is some evidence to suggest the existence of a Balto-Slavic language group after the break-up of Proto-Indo-European, with the Slavic and Baltic languages splitting around the 10th century BC. However, some linguists – Meillet, Klimas, Zinkevičius – oppose this view, providing arguments against a Balto-Slavic group, and explaining those similarities by one or several periods of close contacts. There exist a number of Baltic words that are similar to Sanskrit or Latin and which lack counterparts in Slavic languages. Latvian, Lithuanian, Armenian, Albanian, Slavic and Indo-Iranian languages are grouped as satem languages. While the possession of many archaic features is undeniable, the exact manner by which the Baltic languages have developed from the Proto-Indo-European language is not clear. 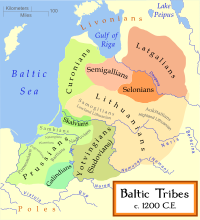 Latvian as a distinct language emerged during several centuries by language spoken by ancient Latgalian tribe assimilating the languages of other neighboring Baltic tribes - Curonian, Semigallian and Selonian, which resulted in these languages gradually losing their most distinct characteristics. This process of consolidation started in the 13th century after the Livonian Crusade and forced christianization. These tribes came under Livonian rule thus forming a unified political, economic and religious space. The oldest known examples of written Latvian are from a 1530 translation of a hymn made by Nikolaus Ramm, a German pastor in Riga,. The oldest preserved book in Latvian is a 1585 Catholic catechism of Petrus Canisius currently located at the Uppsala University Library. The Bible was translated into Latvian by the German Lutheran pastor Johann Ernst Glück (The New Testament in 1685 and The Old Testament in 1691). The Lutheran pastor Gotthard Friedrich Stender was a founder of the Latvian secular literature. He wrote the first illustrated Latvian alphabet book (1787) and the first encyclopedia “The book of high wisdom of the world and nature” (1774), the Grammar books and the Latvian-German and German-Latvian dictionaries. Until the 19th century, the Latvian language was heavily influenced by the German language, because the upper class of local society was formed by Baltic Germans. In the middle of the 19th century the First Latvian National Awakening was started, led by “Young Latvians” who popularized the use of Latvian language. Participants in this movement laid the foundations for standard Latvian and also popularized the Latvianization of loan words. However, in the 1880s, when Czar Alexander III came into power, Russification started. During this period, some Latvian scholars[who?] suggested adopting Cyrillic for use in Latvian. After the czar's death, around the start of the 20th century, nationalist movements reemerged. In 1908, Latvian linguists Kārlis Mīlenbahs and Jānis Endzelīns elaborated the modern Latvian alphabet, which slowly replaced the old orthography used before. Another feature of the language, in common with its sister language Lithuanian, that was developed at that time is that proper names from other countries and languages are altered phonetically to fit the phonological system of Latvian. Even if the original language also uses the Latin alphabet, this process takes place. Moreover, the names are modified in order to ensure that they have noun declension endings, declining like all other nouns. For example, a place such as Lecropt (a Scottish parish) is likely to become Lekropta; the Scottish village of Tillicoultry becomes Tilikutrija. This is a good example of linguistic purism in this language. During the Soviet occupation (1940–1991), the policy of Russification greatly affected the Latvian language. Throughout this period, many Latvians and Latvia’s other ethnicities faced deportation and persecution. A massive immigration from the Soviet republics of Russia, Ukraine, Belarus and others followed, largely as a result of Stalin's plan to integrate Latvia and the other Baltic republics into the Soviet Union by means of Russian colonization. As a result, the proportion of the ethnic Latvian population within the total population was reduced from 80% in 1935 to 52% in 1989. In Soviet Latvia, most of the immigrants who settled in the country did not learn Latvian. According to the 2011 census Latvian was the language spoken at home by 62% of the country's population. Government-funded bilingual education is available in primary schools for ethnic minorities. These include Russian, Yiddish, Polish, Lithuanian, Ukrainian, Belarusian, Estonian and Roma schools. Latvian is taught as a second language in the initial stages too, as is officially declared, in order to encourage proficiency in that language, aiming at avoiding alienation from the Latvian-speaking linguistic majority and for the sake of facilitating academic and professional achievements. Since the mid-1990s, the government may pay a student's tuition in public universities only provided that the instruction is in Latvian. Since 2004, the state mandates Latvian as the language of instruction in public secondary schools (Form 10–12) for at least 60% of class work (previously, a broad system of education in Russian existed). To counter the influence of Russian and English, government organizations (namely the Terminology Commission of the Latvian Academy of Science and the State Language Center) try to popularize the use of Latvian terms and linguistic purism. A debate arose over the Latvian term for euro. The Terminology Commission suggested eira, with its Latvianized and declinable ending, would be a better term for euro than the widely used eiro, while European Central Bank insisted that the original name euro is used. Other new terms are calques or new loanwords. For example, Latvian has two words for "telephone" – tālrunis and telefons, the former being a direct translation into Latvian of the latter international term. Still others are older or more euphonic loanwords rather than Latvian words. For example, "computer" can be either dators or kompjūters. Both are loanwords (the native Latvian word for "computer" is skaitļotājs). However, for some time now dators has been considered an appropriate translation. There are several contests held annually to promote correct use of Latvian. Notably, the State Language Center holds contests for language mistakes, named "Gimalajiešu superlācis" (Gimalayan Superbear) after an infamous incorrect translation of Asiatic Black Bear. These mistakes, often quite amusing, are both grammatical and stylistic; sometimes also obvious typos and mistranslations are considered to belong here. Organizers claim that mistakes are largely collected in areas heavily populated by Russian-speakers, as well as from Lithuanian-owned chain stores. Mistranslations are not necessarily grammatical, but also stylistic and vocabulary mistakes, such as literal translations from the English language. There are three dialects in Latvian: the Livonian dialect, High Latvian and the Middle dialect. Latvian dialects and their varieties should not be confused with the Livonian, Curonian, Semigallian and Selonian languages. The Livonian dialect of Latvian was more affected by the Livonian language substratum than Latvian in other parts of Latvia. It is divided into the Vidzeme variety and the Courland variety (also called tāmnieku or ventiņu). There are two intonations in the Livonian dialect. In Courland short vowels in the endings of words are discarded, while long vowels are shortened. In all genders and numbers only one form of the verb is used. Personal names in both genders are derived with endings – els, -ans. In prefixes ie is changed to e. Due to migration and the introduction of a standardised language this dialect has declined. It arose from assimilated Livonians, who started to speak in Latvian and assimilated Livonian grammar into Latvian. The Middle dialect is spoken in central and Southwestern Latvia. Kursenieki language, which used to be spoken along Curonian Spit, is closely related to the varieties of middle dialect spoken in Courland. The dialect is divided into the Vidzeme variety, the Curonian variety and the Semigallian variety. The Vidzeme variety and the Semigallian variety are closer to each other than to the Curonian variety, which is more archaic than the other two. There are three intonations in the Middle dialect. In the Semigallian variety, ŗ is still used. Standard Latvian is based on the middle dialect. Upper Latvian dialect is spoken in Eastern Latvia. It is set apart from rest of the Latvian by number of phonetic differences. The dialect has two main varieties – Selonian and Non-Selonian. There is a standard language, the Latgalian language, which is based on deep Non-Selonian varieties spoken in south of Latgale. The term "Latgalian" is sometimes also applied to all Non-Selonian varieties or even the whole dialect. However, it is unclear if it is accurate to use the term for any varieties besides the standard language. While the term may refer to varieties spoken in Latgale or by Latgalians, not all speakers identify as speaking Latgalian, for example, speakers of deep Non-Selonian varieties in Vidzeme explicitly deny speaking Latgalian. The history of the Latvian language (cf. below) has placed it in a peculiar position for a language of its size whereby it is spoken by a large number of non-native speakers as compared to native speakers. The immigrant and minority population in Latvia is 700,000 people: Russians, Belarusians, Ukrainians, Poles, and others. The majority of immigrants came to Latvia between 1940–1991; supplementing pre-existing ethnic minority communities (Latvian Germans, Latvian Jews). In a recent survey, 60% of Latvia's ethnic minorities described their knowledge of Latvian as fluent. Fluency in Latvian is prevalent among the younger generations of the minorities. Latvian is an inflecting language with many analytical forms. Primary word stress, with a few exceptions, is on the first syllable. There are no articles in Latvian, however definiteness is expressed by inflection of adjectives. Basic word order in Latvian is subject–verb–object; however, word order is relatively free. There are two grammatical genders in Latvian (masculine and feminine) and two numbers, singular and plural. Nouns and adjectives decline into seven cases: nominative, genitive, dative, accusative, instrumental, locative, and vocative. There are six declensions and no articles. There are three conjugation classes in Latvian. Verbs are conjugated for person, tense, mood and voice. Latvian in Latin script was first based upon the German alphabet, while the alphabet of the Latgalian dialect was based on the Polish alphabet. At the beginning of the 20th century, this was replaced by a more phonetically appropriate alphabet. The modern standard Latvian alphabet uses 22 unmodified letters of the Latin alphabet (all except Q, W, X and Y). It adds a further eleven letters by modification. The vowel letters A, E, I and U can take a macron to show length, unmodified letters being short; these letters are not differentiated while sorting (e.g. in dictionaries). The letters C, S and Z, that in unmodified form are pronounced [ts], [s] and [z] respectively, can be marked with a caron. These marked letters, Č, Š and Ž are pronounced [tʃ], [ʃ] and [ʒ] respectively. The letters Ģ, Ķ, Ļ and Ņ are written with a cedilla or little 'comma' placed below (or above the lowercase g). They are modified (palatalized) versions of G, K, L and N and represent the sounds [ɟ], [c], [ʎ] and [ɲ]. Non-standard varieties of Latvian add extra letters to this standard set. Latvian spelling has almost perfect correspondence between graphemes and phonemes. Every phoneme has its own letter so that a reader doesn't need to learn how a word is pronounced, but simply pronounce it. There are only two exceptions to this, which could cause mispronunciation. The first problem is that the letters E/Ē represent two different sounds: [ɛ]/[ɛː] and [æ]/[æː]. The second problem is that letter O indicates both the short and long [ɔ], and the diphthong [uɔ]. These three sounds are written as O, Ō and Uo in Latgalian, and some Latvians campaign for the adoption of this system in standard Latvian. However, the majority of Latvian linguists argue that o and ō are found only in loanwords, with the Uo sound being the only native Latvian phoneme. The digraph Uo was discarded in 1914, and the letter Ō has not been used in the official Latvian language since 1946. Likewise, the letters Ŗ and Ch were discarded in 1957, although they are still used in some varieties and by many Latvians living beyond the borders of Latvia. The letter Y is used only in the standard Latgalian written language, where it is used to represent /ɨ/, which is not used in other dialects. Latvian orthography allows nine digraphs, which are written Ai, Au, Ei, Ie, Iu, Ui, Oi, Dz and Dž. Latvian Lutheran songbook (hymnal) in old orthography. The old orthography was based on that of German and did not represent the Latvian language phonemically. At the beginning it was used to write religious texts for German priests to help them in their work with Latvians. The first writings in Latvian were chaotic: there were twelve variations of writing Š. In 1631 the German priest Georg Mancelius tried to systematize the writing. He wrote long vowels according to their position in the word – a short vowel followed by h for a radical vowel, a short vowel in the suffix and vowel with a diacritic mark in the ending indicating two accents. Consonants were written following the example of German with multiple letters. The old orthography was used until the 20th century when it was slowly replaced by the modern orthography. Standard QWERTY keyboards are used for writing in Latvian; diacritics are entered by using a dead key (usually ', occasionally ~). Some keyboard layouts use the modifier key AltGr (most notably the Windows 2000 and XP built-in layout (Latvian QWERTY), it is also default modifier in X11R6, thus a default in most Linux distributions). In the early 1990s, the Latvian ergonomic keyboard layout was developed. Although this layout may be available with language support software, it has not become popular because of a lack of keyboards with this layout. Voiced and unvoiced consonants assimilate to the next-standing consonant, e.g. apgabals [ˈabɡabals] or labs [ˈlaps]. Latvian does not feature final-obstruent devoicing. Doubled consonants are pronounced longer: mamma [ˈmamːa]. Same with plosives and fricatives located between two short vowels: upe [ˈupːe]. Same with 'zs' that is pronounced as /sː/, šs and žs as /ʃː/. Latvian also has 10 diphthongs, four of which are only found in loanwords (/ai ui ɛi au iɛ uɔ iu (ɔi) ɛu (ɔu)/), although some diphthongs are mostly limited to proper names and interjections. Standard Latvian and, with a few minor exceptions, all of the Latvian dialects have fixed initial stress. Long vowels and diphthongs have a tone, regardless of their position in the word. This includes the so-called "mixed diphthongs", composed of a short vowel followed by a sonorant. ^ a b "Lettish". TheFreeDictionary.com. Retrieved 2007-07-28. ^ Hammarström, Harald; Forkel, Robert; Haspelmath, Martin, eds. (2017). "Latvian". Glottolog 3.0. Jena, Germany: Max Planck Institute for the Science of Human History. ^ "Latgalian language in Latvia: between politics, linguistics and law". International Centre for Ethnic and Linguistic Diversity. 30 March 2018. Retrieved 6 August 2018. 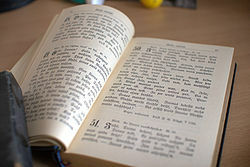 ^ "National treasure: The oldest Latvian-language book in Rīga". Public Broadcasting of Latvia. 25 August 2016. Retrieved 27 October 2017. ^ "At home Latvian is spoken by 62% of Latvian population; the majority – in Vidzeme and Lubāna county". Central Statistical Bureau of Latvia. 26 September 2013. Retrieved 30 October 2014. ^ "Latvian language is spoken by 62% of the population". Baltic News Network. 26 September 2013. Retrieved 30 October 2014. ^ "No 'eira' - but 'eiro' will do". The Baltic Times. 6 October 2004. Retrieved 28 July 2007. ^ "Best and worst words of 2018 underlined". Public Broadcasting of Latvia. 28 January 2019. Retrieved 28 January 2019. ^ BNS (2006-03-30). "Akcijā pret valodas kropļošanu aicina nofilmēt 'gimalajiešu lāci'" (in Latvian). DELFI. Retrieved 2007-07-28. ^ Markus, Dace (2012). "THE DEEP LATGALIAN VARIANTS OF THE HIGH LATVIAN DIALECT IN NORTH-EAST VIDZEME (SO-CALLED MALENIA)". Baltistica (in Latvian). Vilnius University (8 priedas). Derksen, Rick (1996). 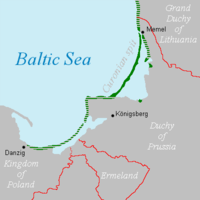 "Metatony in Baltic". Amsterdam: Rodopi. Wikimedia Commons has media related to Latvian language. For a list of words relating to Latvian language, see the Latvian language category of words in Wiktionary, the free dictionary. Wikivoyage has a phrasebook for Latvian.